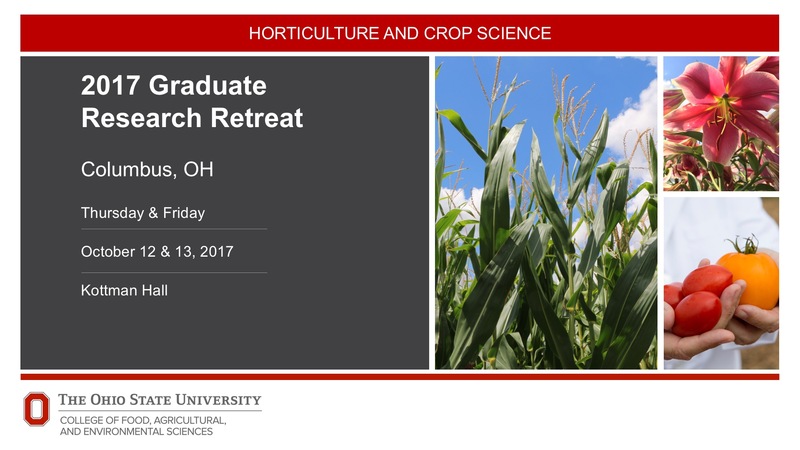 The Department of Horticulture and Crop Science and the Graduate Research Retreat Committee are excited to extend an invitation to the Annual Horticulture and Crop Science Graduate Research Retreat. This year, the retreat will be held on the Columbus campus on October 12th and 13th, 2017. Registration and abstracts are due September 22nd. Each autumn, our graduate students organize a Graduate Research Retreat that takes place at either the Columbus or Wooster Campus. The Retreat is a two-day event designed to highlight the research ideas, experiences, and progress of our students. Poster and oral presentation sessions allow attendees to experience the diversity, depth, and breadth of the science conducted by HCS graduate students. The retreat is an opportunity for students to interact with faculty and peers and to be rewarded for research excellence. Contact Regina Vann Hickok, vann.5@osu.edu (614) 292-3866 for more information about the retreat. The Department of Horticulture and Crop Science and the Graduate Research Retreat Committee are proud to announce its Annual Horticulture and Crop Science Graduate Research Retreat. This year, the retreat will be held on the Columbus campus on October 12th and 13th, 2017. Overnight accommodations will be provided for Wooster-based participants. The retreat is a great opportunity to see the progress of other research areas in the department and to interact with faculty, fellow students and invited guests.